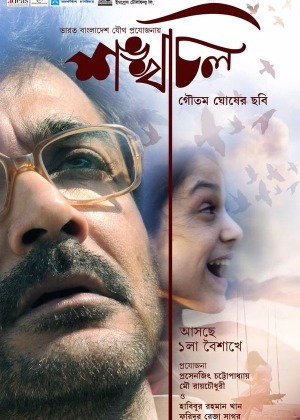 Acclaimed filmmaker Goutam Ghose is back with his latest Bengali film, Shankhachil which is again an Indo-Bangladesh co-production similar to couple of his earlier works Padma Nadir Majhi (1992) and Moner Manush (2010). Shankhachil (boundless) is produced by Prosenjit Chatterjee and Mou Roychowdhury from India, along with Habibur Rahman Khan and Faridur Reza Sagar from Bangladesh. Featuring Prosenjit along with Kushum Shikder, Shajbati (Introducing), Dipankar Dey, Nakul Vaid, Priyanshu Chatterjee, Arindam Sil etc, the film has music by Goutam Ghose himself. Ishaan Ghose is the DOP while editing is by Baishali Dasgupta Bhaumic and Niladri Roy. Drawing inspiration from the partition themed films by Ritwik Ghatak, Shankachil is supposed to portray the angst of the people living near the Indo-Bangladesh border. Set at a place near the Indo-Bangladesh border the film tells the story of a family whose relatives live on both sides of the barbed wire fencing. Winner of the National Award (63rd National Film Awards) for Best Bengali film,Shankhachil will be releasing shortly for Poila Baisakh/Bengali New Year’s Day on 14th April. ← Kunku(1937): V. Shantaram’s tour-de-force!